Jan. 11, 2019 - On Wednesday, during a speech in Qom, Iranian supreme leader Ali Khamenei implicitly expressed his fear of the growing influence of the PMOI/MEK and Iranian resistance units in organizing protests in the streets of Iran and spreading news of protests and demonstrations in social media channels. “The arrogant are inviting the people to confront the system. It’s necessary that the people stand up in front of this publicity and move against it. The youth must transform cyberspace into a tool against the enemy,” Khamenei said. In his speech Khamenei also said, “A while ago, not far from here, an American politician said to a crowd of thugs and terrorists that he hope and wishes to celebrate Christmas in 2019 in Tehran.” Khamenei was referencing a speech by U.S. President National Security Advisor John Bolton at a Persian New Year event hosted by the PMOI/MEK in Tirana, Albania. Khamenei then expressed his happiness that his regime is still standing. Khamenei’s latest remarks is just one of several instances of high-profile regime officials expressing their fear of the imminent threat to their regime of collapse and overthrow and the growing influence of the PMOI/MEK. While Khamenei is encouraging the youth to defend his regime on social media, his own officials are speaking of the futility of trying to counter the activities of PMOI/MEK in online channels and are calling for blocking what little online services remain uncensored in Iran. Other officials have been more explicit in expressing their fears of the growing activism on social media. 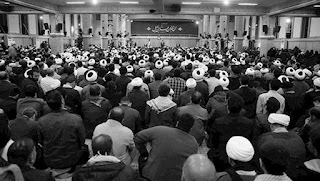 In December, Abdollah Ganji, one of the directors of the IRGC-owned Fars News Agency, said, “The PMOI/MEK members who were relocated from Iraq to Albania are creating content for social media networks.” Ganji also noted that the MEK has had a pivotal role in publishing news about labor strikes and protests and in disclosing the details of the lavish lifestyles of Iranian officials and their children abroad, which is a stark contrast to the extreme poverty that has become the everyday reality of the lives of millions of Iranians. The Iranian regime has tried to stop the free flow of information by blocking access to social media channels. After the 2009 nationwide protests that followed the rigged presidential elections that handed Mahmoud Ahmadinejad his second mandate as president, the Iranian regime set blocks on most popular social media networks, including Twitter, Facebook and YouTube. Last year, following the 2017-2018 uprisings that spread to more than 140 cities across Iran, Tehran blocked Telegram, the messaging and social media app that has over 40 million users in Iran. The regime has tried to establish its control by distributed manipulated and spyware-infected versions of the app among Iranian users. More recently, Iranian officials revealed plans to block Instagram and replace it with a domestic replication of the app that enables the Iranian regime’s security apparatus to spy on users and block access to dissident channels. However, despite their efforts, Iranian regime officials have not been able to contain the protests and maintain control on cyberspace as they wish. Protests continue to rage across the country, reflecting the truth of how the people of Iran feel about a regime that has given them nothing but suppression and corruption for four decades.